The mystery bug that plagued Bukit Batok residents has been identified as a harmless beetle which does not even bite. But what caused their sudden outbreak last month remains unclear. 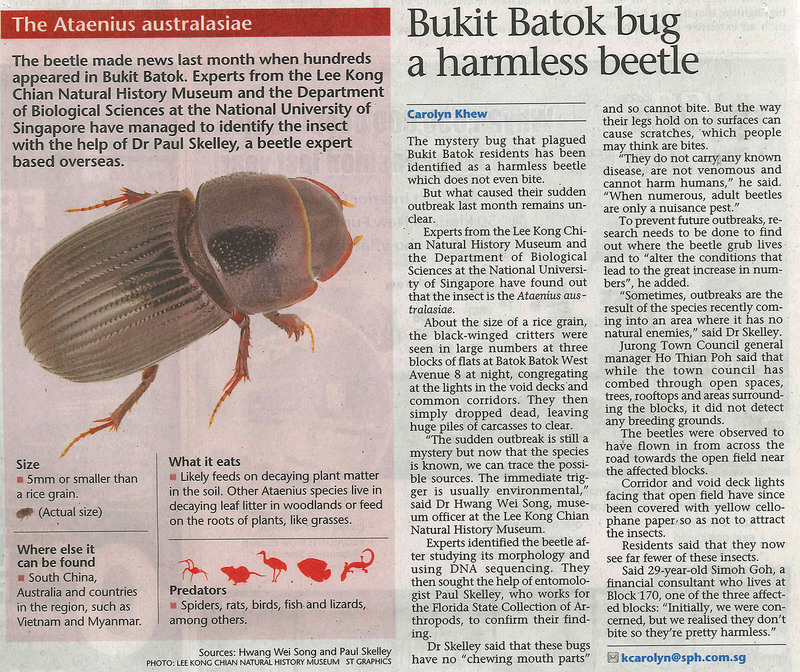 Experts from the Lee Kong Chian Natural History Museum and the Department of Biological Sciences at the National University of Singapore have found out that the insect is the Ataenius australasiae. About the size of a rice grain, the black-winged critters were seen in large numbers at three blocks of flats at Batok Batok West Avenue 8 at night, congregating at the lights in the void decks and common corridors. They then simply dropped dead, leaving huge piles of carcasses to clear. “The sudden outbreak is still a mystery but now that the species is known, we can trace the possible sources. The immediate trigger is usually environmental,” said Dr Hwang Wei Song, museum officer at the Lee Kong Chian Natural History Museum. Experts identified the beetle after studying its morphology and using DNA sequencing. They then sought the help of entomologist Paul Skelley, who works for the Florida State Collection of Arthropods, to confirm their finding. Dr Skelley said that these bugs have no “chewing mouth parts” and so cannot bite. But the way their legs hold on to surfaces can cause scratches, which people may think are bites. To prevent future outbreaks, research needs to be done to find out where the beetle grub lives and to “alter the conditions that lead to the great increase in numbers”, he added. “Sometimes, outbreaks are the result of the species recently coming into an area where it has no natural enemies,” said Dr Skelley. Jurong Town Council general manager Ho Thian Poh said that while the town council has combed through open spaces, trees, rooftops and areas surrounding the blocks, it did not detect any breeding grounds. The beetles were observed to have flown in from across the road towards the open field near the affected blocks. Corridor and void deck lights facing that open field have since been covered with yellow cellophane paper so as not to attract the insects. Residents said that they now see far fewer of these insects.